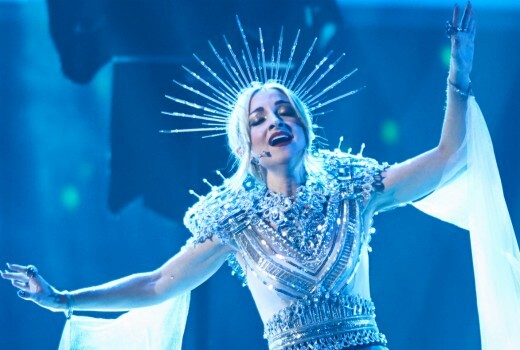 Kate Miller-Heidke is off to Tel Aviv to sing Zero Gravity after winning Eurovision: Australia Decides on the Gold Coast. 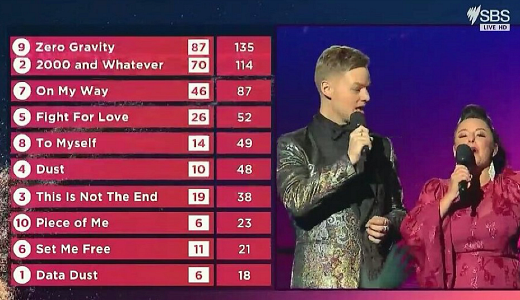 SBS turned on a spectacular “mini Eurovision” hosted by Joel Creasey and Myf Warhurst wthKate Miller-Heidke topping both the Public and Jury votes. After winning over the Australian public with 87 points and a jury of industry experts with 48 points, she scored 135 points overall. 10 acts performed in a 2.5 hour Live show vying for the chance to represent Australia in Israel in May. “I’m totally overwhelmed! This has been a peak experience already, and I’m dying with excitement at what’s to come. Thanks to everyone who voted, and to all the other artists who provided such a brilliant, eclectic and stiff competition. I’ve had a ball, and I’m so grateful and thrilled that I get to represent Australia at Eurovision in 2019,” Miller-Heike said. Dami Im, Hans and Casey Donovan also performed in a glam show produced by Blink TV. For the past few days I’ve had Time After Time by Cyndi Lauper in my head and went back and listened to this Kate Miller-Heidke song and low and behold that is where it came from. Sure the tune is nothing like Time After Time, however Kate’s phrasing at the start and in some other parts matches it well, this will likely do well at Eurovision because of that (other songs that have a similar to another song feel have). From someone who is generally apathetic towards Eurovision, I think Kate is the perfect choice to both represent the country and inspire more interest. I might give it a shot to see how she goes this year. Kate was amazing. I voted 6 times for her in the end… she deserved it!! The song is sooo eurovision. Amazing combo of opera and dance i loved it!! Well done SBS great production!!! Seriously great viewing. KMH performance and song was totally bonkers and so over the top it was coming down the other side. She will do well as that is exactly what they look for over there. I don’t understand the “points” worked here. KM-H got 87 points from the public? 87 of what? How is that number derived? It was never explained on the show how those points are worked out. yes I agree, the audience points add up to 295? That’s a pretty random number. If the points system is based on the split 50-50 system in the main contest, both the public vote and the vote from the international jurors have the exact same amount of points to give. The five jurors each have 10 sets of points to give out (1 to 10, and 12 points), totalling 290 points. The points from the public are based on the percentages each song got based on the total amount of votes received. So for example, since Kate got 87 points from the public, it means she has 30% of all televotes received. Her closest competitor, who got 70 points, fell short with a 24% share of the votes sent by the Australian public. I was completely torn between KMH and EF (love the acoustic version of EF posted here). I was so impressed at what SBS was able to pull off here. Some amazing performances, great production values, a lot of the songs were genuinely decent, all packaged together in a smoothly run highly enjoyable show. Bravo SBS – talk about showing the commercial networks how it’s done. Don’t forget Casey Donovan kicked off the show performing Australia’s first Eurovision song “Tonight Again” by Guy Sebastian. Good point, I have added. A phenomenal show. Big congrats to SBS and all the performers. Haven’t seen a live show that good in Australia for quite some time. Kate’s voice is amazing…her control and range is second to none…the performance was spectacular…but the song….can anyone say they really understood it? Totally agree, do you go with Kate for quality or Sheppard for excitement. When it’s euro it is a hard decision. She will impress. Lots of luck ,Kate. Loved KMH and thrilled she won.Can’t wait to see her perform on the Eurovision stage. Worthy winner. But the big skirt has been done before, the bendy pole person was awesome. Courtney Act had the most polished performer and I can’t help but think she would have been our better rep for Eurovision. But what an amazing show SBS put on!!! Bravo!